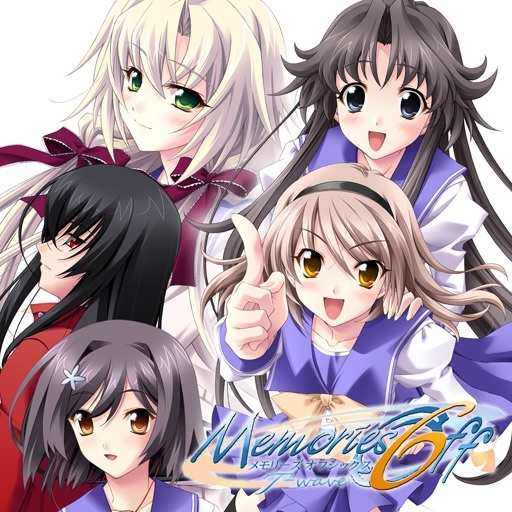 Memories Off 6 ~T-wave~(簡体版) is a visual romantic adventure novel based on the concept of ''''Return to Origin''''! The sixth episode in the series has finally been released for iPhone and iPod touch! * The game supports simplified chinese only. * Tag line of the series: Irreplaceable feelings...with you! * The story in ~T-wave~ revolves around the locations used for the first series of Memories Off: Sumisora City and Sumisora Benzai-ten (a historical shrine located 20 minutes walk from Sumisora station). * Play as one of 5 heroines, including Ririsu Tohmine who is a childhood friend of the main character. * Writing talent such as Chabo Higurashi, Hiro Akizuki, Dai-san-gen, Hiroaki Miura, Takuya Baba and Yayoi Sawatari all contributed to the scenario development! * Musical score by Takeshi Abo. Character design by Takayuki Koshimizu and Yukihiro Matsuo! * More than 25 hours of gameplay! * An engrossing experience for both ''''Memories Off'''' veterans and newcomers to the series! Intuitive touch panel controls ensure a smooth gameplay experience! Game resumes after pressing HOME or receiving calls! The exams are finally over. The students at Sumisora Gakuen High School are free from the midterm exams and are getting ready for the annual school festival. Shio Tsukamoto opens the door with a sigh. Inside the room he sees his childhood friend, Ririsu Tohmine, half sleeping. He reluctantly wakes her up as she is sleeping in an odd posture. However, rather than showing appreciation she yells at him and lashes out with a low kick. In Sumisora City, Kanagawa prefecture, it is already deep autumn, the streets on the way to Private Sumisora Gakuen High School are covered by colorful falling leaves. Shio Tsukamoto is walking with his childhood friend, Ririsu, on the way to school. "Ririsu used to be very cute..." Shio thinks to himself, remembering days gone by when she was younger and used to follow along behind him. Some time ago, family problems had forced Ririsu to move away to another city and while she was there she had changed and become very selfish. Now, although Shio is a good and kind friend, Ririku treats him like a servant. This proves to be a constant source of amusement for Shio''''s classmates and they make fun of him, joking that he will make a good wife someday! Because of Ririsu, Shio has never had the chance to find a girlfriend. One day, Ririsu introduces Shio to her classmate Chisa Hakosaki. Chisa was once very quiet and shy, but now her personality has evolved, "Will you dance with me at the school festival party?" Chisa asks Shio. Shio is confused at being asked out on a date by Chisa. Ririsu stares at Chisa and Shio, a complex expression spreading across her face.